Horse stalls are an obvious necessity for any barn that houses horses. A horse by nature is a social animal, and in turnout you will often find them together even though there is lots of space to spread out. However, it is generally considered a good rule for each horse to have its own stall in the barn. Horse stalls become a place that each horse can call its own. Shopping for horse stalls? Get great horse fencing to match! Call us for the details: 877-306-4024. How many horses do you have, or how many are you planning to have? This will help determine how many stalls you will need, since there should be a direct correlation between number of horses and number of stalls. Some arrangements allow all horses to have open access to all stalls, and with that type of layout you may find 2 horses in one stallat some point, but that should happen by choice. Do you want to buy your horse stalls, or build them yourself? Building them is not really that difficult and it will save you some money. However, it does take some of your time, and you want to make sure you build them correctly. Plans are widely available, and if you’re somewhat handy with a hammer and have the time available you could do this. Of course, if you are planning to purchase a large barn and house a dozen horses, building 12 wood stalls is going to take a while unless you have help. How big should the horse stalls be? This will be determined in part by the size of your barn and how many horses you have. At a minimum, figure on 12 feet by 12 feet for each box stall. Bigger is better if you have the space. Remember, part of the space in the stall will be used by shavings since the horse will be unable to evacuate themselves outside. Box stalls, or stalls with runs? Each has its purpose and advantages. If you are keeping a show horse, a box stall is handy to keep the coat shiny. Too much exposure to the sun will fade the color in the coat. However, you should plan on turning out or riding the horse for a while each day – exercise is a requirement for good health. Horse stalls with runs mean your horse will get some exercise during the day. The horse can come and go as he pleases, and he can even socialize with the other horses to a degree since they can see and hear each other while out on the run. Runs need to be divided by a panel and rails and the top rail should ideally be no less than 54 inches high. What kind of gates and stall latches should your horse stalls have? Any gate should look nice, function easily, and be completely secure. Latches should keep the gate in place securely, and be completely tamper-proof by your horses. This is where we can help in a big way. We have gates and latches that are the best in the industry. 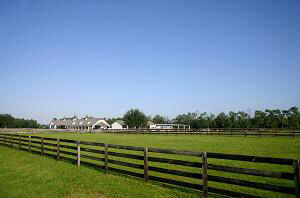 your horses will appreciate the security and safety we offer! As you have probably already discovered, there are a lot of options when planning out your horse stalls, your barn, and your fences and gates. We would love to talk with you and explain the advantages our products have over the “traditional” fences. You are really going to like what we have.